Back in 1999, Robert Loppie and Jason Vaillancourt best friends wanted to start their own business and offer something unique that no one else was offering. That year Nova Scotia implemented a mandatory residential curbside organics program using green carts to collect and store residential food scraps. The light bulb went off because they knew the bins are going to get really dirty and smelly. Hence, Bin Doctor was born offering a 100% eco-friendly mobile bin cleaning service that destroys germs and sanitizes the bin. It didn’t take long, however, before the team saw the opportunity to grow. They expanded to create products and services that would help people recycle and compost easier at home and at work. Today, these products are sold in major retailers across the country including Sobeys, Atlantic Superstore, Canadian Tire, Kent Building Supplies, Wal-Mart and many other independent retailers. 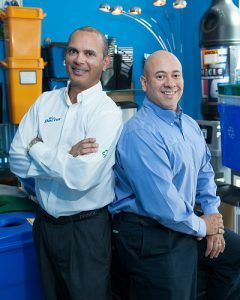 The products help businesses and home owners become more efficient in sorting and separating their recyclables. “Because of what we do, they are able to recycle easier and recycle better, which means fewer products entering the waste stream”. Throughout the company the focus is on the three R’s of reduce, reuse, and recycle and find small ways to be as sustainable and environmentally conscious.